It's rare that I actually buy RPGs anymore, let alone pre-order them, but that's what I did with the Dungeon Crawl Classics Role Playing Game. I was initially very skeptical of the game and its approach, as you may recall from some of my posts about it in the past. That feeling didn't dissipate once the open playtest began last year. Over time, though, my opinion softened considerably and in fact I've come around to seeing the advent of DCC RPG as a good and worthy thing. Mind you, I'm one of those guys who actually sees value in anyone and everyone publishing their game, even if that game is "just another clone." Now, DCC RPG is not just another clone, but the principle is the same for me: publish for yourself and don't worry about anyone else. I bring this up because, yesterday morning, I received word that the PDF of the Dungeon Crawl Classics Role Playing Game was available for download for those of us who'd pre-ordered the game. So, I happily snagged a copy and, while I was too busy yesterday to have much of a chance to do more than glance at it, I've been spending this morning reading it more intently. I'll have more considered thoughts on the thing, after I've digested it more thoroughly, but let me say this right now: I'd like to play this game. Again, this is a rare thing; by and large, I've already got all the RPGs I need and am not in the market for any more. But DCC RPG looks like a lot of fun to play, like an extremely well-read and much more self-aware version of HackMaster -- and I mean that as a very high compliment. Will it replace Labyrinth Lord as my go-to game for fantasy? Nope. Can I imagine playing a multi-year DCC RPG campaign with my gaming group? No. Heck, I'm not even sure that's possible. Are either of those things strikes against DCC RPG? Not in the slightest. Seriously, this is a very well written and presented game that knows what it's about and gives it to you. It won't be to everyone's tastes and I consider that a good thing. We already have enough lowest common denominator mass market entertainment as it is and Goodman Games should take considerable pride in not having given us more of the same. It looks fun in many ways. It certainly contains the Appendix N inspiration it claims. I would have liked more spells beyond 3rd level and it seems a bit light in other area as well. I was in an early play test run by Joe Goodman at Garycon in 2010 and loved it. While it's not something I'd run myself (I'm too stuck on AD&D), it had the right feel to it, in the sense that it was a rather wild and wooly game and did not fel stilted or constrained like I imagine full on D&D3 would be. It also has the distinction of being the fastest I've ever seen a PC die - less than 1 minute in, someone died touching the door handle leading into the dungeon. Fun stuff! 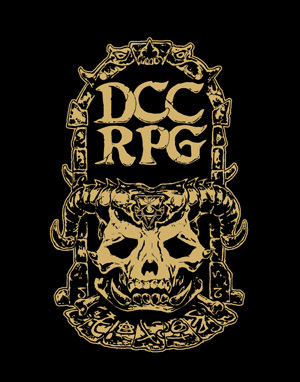 That DCC RPG logo is reminiscent the War Pig logo from the cover of the 1977 album Motorhead by Motorhead. Another '70's visual cue? That's almost certainly the case. I'd like to know how it stacks up against ACKS. I suppose, by what you've written, ACKS has DCC beat in the long term campaign department. But all the tables and need for Zocchi dice (a gimmicky thing in my opinion) also turn me off. I'm sure it has a place in the wide open and rich OSR firmament, but I am not a fan of it's niche I suppose. To me, the Autarch guys were a lot more humble and classy during the development of their game. I love the art in the book. The art is amazing. It's one of the most beautiful RPG books of any kind I've seen published in many a moon. That's entirely consistent with my own assessment, James. I'd happily sign up for a DCC game at a convention, for instance, but I don't see it being particularly suited for long-term campaign play. The death toll has become a lot less vicious as the game evolved. Don't take a zero level game for the tone of the whole system. I've been involved with this game for the past year, and I stopped doing zero level demos for that reason. First levelers are about as tough as in any OSR offering, and in some ways a little tougher. Yes, there are light areas. Joseph understand that this ga,e is going to be picked up mainly by OSR guys and hobbyists. He expects the game to be house ruled and expanded by the consumer. On my first pass through the book, I didn't really think it was any "lighter" in terms of the subjects it treats than most old school games. In fact, it's considerably more complete and useful in my opinion than some. Spells and Magic Items were my main disappointment. The quickstart really caught my imagination with lots of odd quirk things like the Luck score table. Most of the really cool things were in the quickstart. I was surprised that the entire title scheme was included in the quickstart. The classes only go to tenth level. Couldn't they come up with a few more? It was more little things like that rather than system issues where I felt it was light. The DCC modules have always had weirdness and uniqueness that made them so much fun to DM and play even in a rules heavy system like 3e. I was looking forward to seeing what they would come up with but it wasn't exactly what I was hoping for. And in all fairness, I will be using the various monster variety tables. Loved them! I've been a part of the playtest for a year or so now and I think that the DCC RPG is excellent, particularly for short campaigns. As with the others, I'm not sure that DCC will be my 100% go-to game, but it will contribute some great ideas and styles to my gaming. I forecast that someday I'll be playing something like a blend of OD&D, C&C, and DCC with some of the best features of each. And the art is outstanding. It's one of the most amazing RPG books I've ever seen, within the parameters that it's trying to capture an "old school" B&W style. Joseph Goodman said once that in designing DCC, he's putting together the game that _he_ wants to play. It certainly plays well! Oh, it's complete as a system, but in places, especially monsters and magic items, where room was left over to invite a judge to invent his own. It's almost mantra-like how often the reader is implored to make the game unique. I will be starting a DCC game on Google + on 4/14 at 3pm CST. I would love to have you in the game James (or anyone else who is interested). I ran several sessions with the beta rules during the first few weeks of Constantcon. The funnel never failed to create a memorable experience. According to the book, even 5th level characters are extremely rare in DCC. A 1o level DCC character is considerably more powerful than a 10 level pc in a comparable system. Pretty similar to my own thoughts. I don't expect it to replace AD&D or S&W as my go-to version of D&D, but I do, indeed, want to run it and will no doubt do so, on occasion. And it was worth the purchase, as an Old School Art book, alone! I am very glad such a fine product is being published, but I wouldn't be interested in playing in a DCC-based campaign unless nothing else was available. My opinion is based solely on the publisher's statements about the game and early reviews ... it may change as more information become available. Unfortunately, it seems to hit several points that are "down-checks" for me. If it's trying to simulate fantasy fiction more closely, and if he thinks that 'Gandalf is a fifth-level magic user', it would make sense to have limited levels. Maybe he thinks that "Gandalf is a fifth-level magic-user". That would explain why he used his spells so sparingly. well considering that most old D&D games I've heard of usually capped out around 10th level, with the math of the game usually breaking down by the time you hit 20th, it probably makes sense that DCC would just cap it at 10. I suppose the game was never meant to cover "epic hero" quests. Perhaps I wasn't clear. I wanted more titles for levels. The titles only go up to fifth level when the classes continue to go up to ten. I meant "only tenth level" to refer to the fact that I didn't feel it would be challenging to fill out the last five levels with titles. Those are the things I enjoy seeing in books and the Goodman Games books usually have plenty. I didn't feel that was the case. Most of the spells were D&D rehashes with very few fourth or fifth level spells and magic items were nearly a no show (although I understand and appreciate why). Ah, I see! Yeah, it does sound weird if levels 1-5 have titles, but 6-10 don't. Thanks to Joseph Goodman, I recently received an advance copy of the Dungeon Crawl Classics Adventure Starter that'll be released to the public on Free RPG Day next month. The Adventure Starter consists of two adventures, one for 0-1st level characters and another for 5th level characters. Though very short, the adventures are quite interesting and have a nice pulp fantasy vibe to them. You can tell that Goodman and his collaborators have really been immersing themselves in the literary forebears of D&D as preparation for writing the DCC RPG.I'll probably do a lengthier "review" of this product later. For now, I'll only say that, the more I see of the Dungeon Crawl Classics RPG, the more intrigued I am. I'm starting to think that may prove to be a bigger success than people are expecting. Neither a true clone nor really "3e lite," as some have suggested, the DCC RPG is most definitely its own game with its own sensibility. This fact, coupled with its little quirks, like the Zocchi dice, and what I am sure will be solid adventure support from Goodman, ought to distinguish it from any of its competitors.A year ago, I wasn't all that enthusiastic about the DCC RPG. Now, I'm actually looking forward to its release. Heck, I'd love to play it, which is about as ringing an endorsement as I can give a game that's not even been released yet. Post as … Showing 17 comments Sort by Popular now Best rating Newest first Oldest first Subscribe by email Subscribe by RSS Nicomoscosca 0 minutes ago I bit the bullet & bought the game. I probably will never actually play it, though. It looks like a fun read.And who knows, maybe when I visit my old gamer budies, who moved, I'll toss it my bag for a one shot here and there.Heh, even if I play it a only a couple of times, I will have got twice the millage out of it that I got from 4E D&D.